You can treat your Diastasis Recti, you can live with it, you can do sports with it. We are here to help you. Trainers of RTM - Rectus Training Method. It most often develops throughout pregnancy, so the most affected group of population is the women after giving birth. BUT it does not only develop due to pregnancy, so it does not only affect the women after giving birth. Incorrect training, wrongly executed abdominal exercises can lead to Rectus Diastasis for anyone. 5. Once evolved it needs constant attention. You closed it in vain if you don't care about it anymore or if you continue to train with the wrong technique. It will reappear. 6. Regular lower back pain, weak pelvic floor muscles and big tummy can all accompany Rectus Diastasis. 7. In most cases the separation can be closed to less than 1 cm (half an inch) in 1-2 weeks with a few minutes of exercises - targeting this problem. 8. It is important to be aware of your condition through your entire life and after have closed the separation you should take care of keeping it closed. 1. You do not have to accept your physical and mental condition, if it is not comfortable for you. You can make both better. 2. You have to be very careful and conscious when regenerating your body. 4. Your abs separation can be regenerated by doing special workout, not only by an operation. 5. The way you move, how you stand up or sit down, pick up and hold your baby all have an effect on your abs and pelvis, so you should be very careful to do them the right way. 6. You can make your pelvic floor much stronger after giving birth you do not have to live with the side effects of a weak muscle. 7. Taking care of your body is not a sign of being selfish, you are not a bad mom if you make time for yourself. Your wellbeing is the basis of your child’s well being. This story is about one of my friends and trainees, this could be surprising as I usually work with postnatal women and the program was also created mainly for them, but there is a lesson to learn: this problem is not gender-specific. He is here to tell his story, read it well and learn from it; the proper workout is essential. Tamas had weight problems through his whole life, and because of it – or despite of it – he has been doing hard workout in the last 16 years. His abs problems started when he added an extra 16-exercise abs program to his regular workout, and did it several times a week with his friends. All these exercises were based on crunches and sit-ups. ‘It actually meant crunches in series of various positions i.e. feet towards each other and with legs up straight – this felt the worst for me. There were also side sit-ups with one shoulder on the ground. How to check your tummy - do you have Diastasis Recti? Lie on your back with bent knees, feet closed on the floor. Lift your head and carefully try to find a "gap" around your bellybutton.If you find a wide separation than turn your fingers crosswise and examine how big is the distance between the two muscles. Slide your fingers towards your pelvis and your head as well to know how long did your Diastasis Recti develop. If a few inches under/above your bellybutton you feel a gap wider than 2cm/1inch then by all means you need to do special exercises. Do not push back any navel hernia! 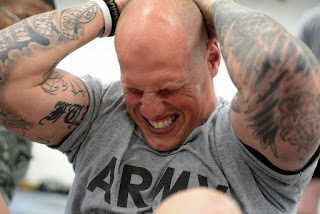 If you don't feel anything or you are not sure than try it in the opposite order: put your fingers in line with your bellybutton still before you would lift your head. Put some gentile pressure to your tummy and lift your head. The tummy is the part of our body that gets most often labelled as "problematic". Men want to get rid of their beer belly while women are working on their postnatal tummy. Unfortunately, most of the times incorrectly - so the result becomes even worst. 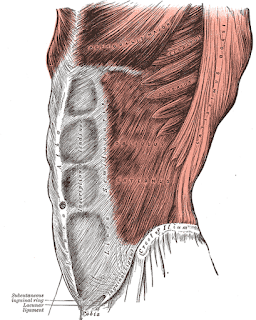 The connective tissue dividing the abdominal muscles in the midline of the body is called Linea Alba. 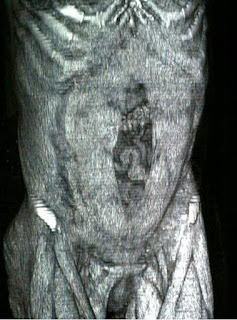 If this connective tissue is stretched out, then the rectus abdominis muscles get far from each other and cannot perform their function. What are the functions of the abdominal muscles? Sit-ups and crunches are very common, but unfortunately very harmful exercises after giving birth especially with abdominal separation (Diastasis recti/Rectus diastasis). These exercises are not good for your pelvic floor and spine, even if your abdominals are healthy. Doing wide and / or deep squats (wider than hips, deeper than horizontal) are never good for your pelvic floor, but in a postpartum stage it can cause irreversible injuries and can have a life-long effect on the overloaded/injured pelvis. The pubis is also sensitive and vulnerable, so we need to be very careful. Please, do not hold weight (even your baby) during wide squats! High intensity workout is a very good and effective way of keeping your body toned and healthy – after having your abs and pelvis regenerated and healed. But not until that point. Why? The RTM - Rectus Training Method focuses on the treatment of Diastasis Recti. Our goal is to regenerate the abdominals, and to teach you how to live with this problem, how to do sports with this problem, and how not to harm yourself during your activities. The founders of this method are M.D. Tímea Kerekes gynecologist and Renáta Tőkés Pre- and Postnatal Fitness Specialist, Country Leader of the Kangatraining in Hungary. We deal with postnatal problems, and our follow-up activities with the trainees are one of our top priorities.